This month, we shine the spotlight on Ran Zhang. Ran was the scholarship recipient at this year’s World Workplace. She credits the Georgia Tech professors and Student Construction Association for connecting her with IFMA Atlanta, and is very grateful for the help and support she has received from the many wonderful people she has met in our Chapter. 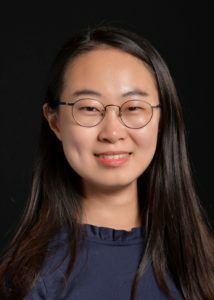 After completing her undergraduate studies at North China Electric Power University in Baoding, Hebei Province, Ran moved to Atlanta in August of 2016. Her parents, who worked at the power company in Shijiazhuang, understood the importance of high quality education and encouraged Ran to pursue her graduate studies in the United States. In December, Ran received her Master of Science in Building Construction and Facility Management Degree from Georgia Tech, graduating with a perfect 4.0 GPA. Her mother made her first trip to the United States to see Ran receive her degree. After graduation, they traveled together to California and Arizona to visit San Francisco and the Grand Canyon. Networking in Atlanta was challenging at first for Ran. So, she volunteered at Atlanta Workplace in 2017, and met many IFMA Atlanta members that day. This helped build her confidence, and now she says “Every time I go to an IFMA event I see more faces that I recognize and more people that I know.” When she was in Houston at World Workplace to receive her scholarship, networking was much easier for her. The other scholarship recipient took notice and complimented Ran’s networking skills. I asked Ran to share something with us that most people may not know about her. She told me that she earned a license to operate a drone for commercial purposes and plans to purchase her own drone with her first paycheck. Ran Zhang is at a crossroads in her life, and I just know that good things lie ahead for her. IFMA Young Professionals Mixer – Thursday! Special Seminar Focusing on New Edition of Facility Management Handbook! FMs Need to "Go Organic"